Introduction The effectiveness of non-invasive positive pressure ventilation (NIV) in COPD patients with prolonged hypercapnia after ventilatory support for acute respiratory failure (ARF) remains unclear. We investigated if nocturnal NIV in these patients prolongs the time to readmission for respiratory causes or death (primary endpoint) in the following 12 months. Methods 201 COPD patients admitted to hospital with ARF and prolonged hypercapnia >48 h after termination of ventilatory support were randomised to NIV or standard treatment. Secondary outcomes were daytime arterial blood gasses, transcutaneous PCO2 during the night, lung function, health-related quality-of-life (HRQL), mood state, daily activities and dyspnoea. Results 1 year after discharge, 65% versus 64% of patients (NIV vs standard treatment) were readmitted to hospital for respiratory causes or had died; time to event was not different (p=0.85). Daytime PaCO2 was significantly improved in NIV versus standard treatment (PaCO2 0.5 kPa (95% CI 0.04 to 0.90, p=0.03)) as was transcutaneous PCO2 during the night. HRQL showed a trend (p=0.054, Severe Respiratory Insufficiency questionnaire) in favour of NIV. Number of exacerbations, lung function, mood state, daily activity levels or dyspnoea was not significantly different. Discussions We could not demonstrate an improvement in time to readmission or death by adding NIV for 1 year in patients with prolonged hypercapnia after an episode of NIV for ARF. There is no reason to believe the NIV was not effective since daytime PaCO2 and night-time PCO2 improved. The trend for improvement in HRQL favouring NIV we believe nevertheless should be explored further. What is the effect of nocturnal non-invasive positive pressure ventilation (NIV) alongside standard medical treatment in COPD patients with prolonged hypercapnia after ventilatory support for acute respiratory failure? We could not demonstrate an improvement in time to readmission or death by adding NIV for 1 year in COPD patients with prolonged hypercapnia after an episode of NIV for acute respiratory failure. 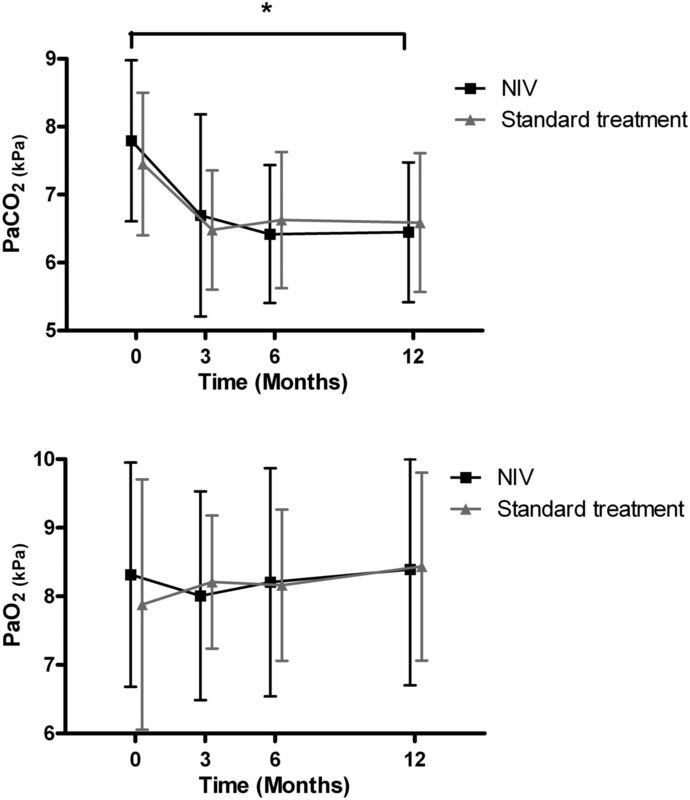 NIV did improve daytime PaCO2 and night-time transcutaneous PCO2. This and the trend for improvement in health-related quality-of-life favouring NIV should be explored further. Two other studies investigated the effects of long-term NIV in the most severe subgroup of COPD patients; that is, patients with acute-on-chronic respiratory failure. These indicated a benefit from long-term NIV in patients who previously required mechanical ventilation for treatment of ARF and who remained hypercapnic thereafter.6 ,14 Unfortunately, these were both small studies and given the huge impact of COPD on mortality and morbidity15 further studies are urgently needed. We hypothesised that providing nocturnal NIV alongside standard medical treatment to patients who remain hypercapnic after ventilatory support during ARF would prolong the time to readmission for respiratory causes or death. Therefore, we conducted an RCT comparing nocturnal NIV with standard treatment for 1 year. The RESCUE trial (REspiratory Support in COPD after acUte Exacerbation) was a multicentre, prospective, randomised controlled study recruiting COPD patients who were admitted to hospital with ARF and treated with ventilatory support throughout the Netherlands between 1 December 2007 and 1 July 2012. A total of 201 patients with severe COPD from 47 hospitals were enrolled by three centres for home mechanical ventilation (University Medical Center Groningen, Maastricht University Medical Center and the Erasmus Medical Center, Rotterdam) with a follow-up of 12 months. Inclusion criteria were: (1) COPD, GOLD stage 3 and 4;15 (2) >48 h independence from ventilatory support (invasive or non-invasive) for ARF; and (3) prolonged hypercapnia (PaCO2 >6.0 kPa) during daytime at rest without oxygen or ventilatory support. The study was approved by the local Medical Ethics Committee of the University Medical Centre Groningen, University of Groningen, patients gave informed consent to participate in the study and the trial was registered at the Nederland's Trial Register (NTR1100). For a more detailed description of the methods used, see online supplementary file. Nocturnal NIV was started by a highly experienced nurse practitioner from the nearest home mechanical ventilation centre who visited the hospital where the patient was admitted. NIV was initiated by bi-level positive airway pressure in the spontaneous/timed mode (Synchrony, Respironics, INC, Murrysville, Pennsylvania, USA) starting with a low back up frequency of 12/min with the aim to: (1) maximally support respiration and (2) and achieve normocapnia. NIV was initiated with an inspiratory positive airway pressure (IPAP) of 14 cm H2O and gradually increased during trials to a maximal tolerated level. Expiratory positive airway pressure (EPAP) was started at 4 cm H2O and increased if auto-PEEP was present or when patients used respiratory muscles to trigger the ventilator. Respiratory rate (RR) was set as close as possible to the RR of the patient, with adjustments if the patient triggered too much. Inspiration to expiration time was 1:3, with a short rise time and then titrated on comfort and effectiveness. All patients were initially given ventilation by means of a full-face mask and humidification to maximise comfort. Effectiveness with NIV during the night was observed by monitoring the transcutaneous O2 saturation and PCO2 (PtCO2) with the TOSCA device (TOSCA 500, Linde Medical Sensors AG, Basel, Switzerland).17 Adherence to NIV was derived from time counters in the NIV device. At baseline, arterial and lung function measurements were performed just before randomisation. Baseline HRQL was assessed after randomisation while transcutaneous measurements were performed during the night after patients were adjusted to NIV but before discharge of the initial admission for ARF. Lung function and arterial blood gas measurements were repeated after 3, 6 and 12 months during visits to their regular pulmonologist. Arterial blood gases were taken while breathing room air; however, when patients were unable to stop oxygen therapy even for short periods, measurements were taken with their usual oxygen flow rate. The nurse practitioner also visited all patients at home after 3, 6 and 12 months to collect survival, admission and exacerbation rates, HRQL and transcutaneous measurements, and if necessary to adjust NIV. The long recruitment period enabled us to extend survival follow-up beyond 12 months to maximally 68 months for the first patients who entered the study. 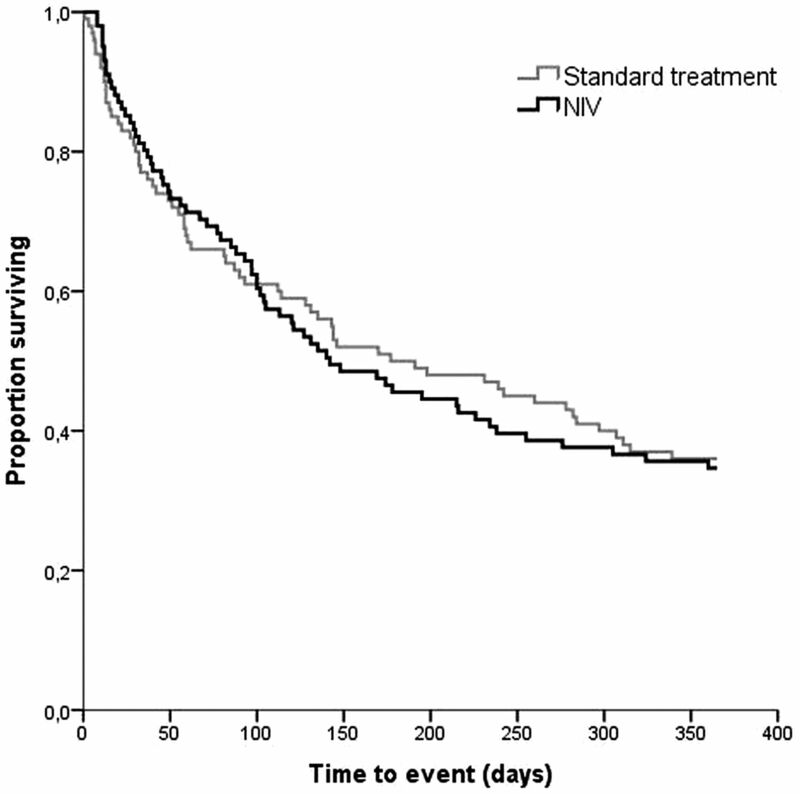 Time to event (readmission for respiratory cause or death) as primary outcome was used to determine the sample size based on the assumption of an event-free survival of 20% in the standard treatment group5 after 12 months and 40% in the NIV group. With an α of 0.05 and a power of 80%, we needed 174 patients to detect the 20% difference in event-free survival between groups. Estimating a maximum dropout rate of 15%, 200 patients were needed. The primary outcome and survival analysis were based on intention-to-treat (ITT) using Kaplan–Meier estimates and the log-rank test. A complete case analysis was performed for the remaining secondary outcomes comparing data of the patients who completed the 12 months (completers) as the number of dropouts was considerable due to progression of the disease and reluctance to adhere to study requirements. Arterial blood gas measurements could not always be performed under similar conditions for every patient. Therefore, data were analysed in two ways; first regardless of oxygen use or the amount of oxygen and second only comparing baseline and 12 month data when either the measurements were both on room air or both on oxygen at the same flow rate (also see online supplementary file). As not all patients were compliant to NIV, either not using it every night or refusing treatment altogether, a per protocol analysis comparing patients in the NIV group who used ventilation >5 h/night with standard treatment was conducted based on results of a recent meta-analysis showing positive effects on change in arterial blood gasses in this subgroup.25 All statistical calculations were performed using IBM SPSS Statistics V.20 (IBM, New York, USA). In all, 201 patients met eligibility criteria, 101 were randomised to NIV and 100 to standard treatment (figure 1). At baseline, patient characteristics and demographics did not differ significantly between treatment groups for ITT as well as the completers (table 1) except for the total number of admission days in the previous year. Reasons for dropping-out of the study are listed in the online supplementary table S1. Four patients classified as dropouts crossed from standard treatment over to the NIV treatment during the study. They remained in the standard treatment group for all ITT analyses. CONSORT flow diagram. Early dropouts: When patients refused or were not able to continue the protocol (either NIV or standard treatment) within 10 days after inclusion. Completers: number of patients included in the complete case analysis. Four patients classified as dropouts crossed from standard therapy over to the NIV treatment during the study. ITT: number of patients included in the intention-to-treat analysis; n, numbers for analysis; †n, number of patients who died within the dropouts; NIV, non-invasive positive pressure ventilation; p-p, included in the per protocol analysis of patients who used ventilation >5 h/night. Patients randomised for NIV were discharged with a mean±SD IPAP of 19.2±3.4 and EPAP of 4.8±1.0 cm H2O, respectively, mean RR on NIV of 15±3 breaths/minute, an inspiration time of 1.1±0.3 s and a rise time of 0.2±0.11 s. Settings were not different between the completers and the dropouts. Overall, 68% received oxygen combined with NIV during the night. Nearly all patients were ventilated through a full-face mask, one using a total face mask. Minor adjustments were made during the study to improve adherence, blood gasses and/or comfort. After 1 year, the remaining 54 patients were ventilated with a mean IPAP of 21.0±3.4 and an EPAP of 5.2±1.2 cm H2O. Two additional patients switched to a total face mask. Mean duration of NIV use per night until death or last follow-up was 6.3±2.4 h/night in the total group and 6.9±2.1 in the completers. Patients included in the per protocol analysis (NIV >5 h) reached an average of 7.7±1.5 h/night (n=43). One year after discharge, 65% versus 64% of patients (NIV vs standard treatment) were either readmitted to hospital for COPD or had died. 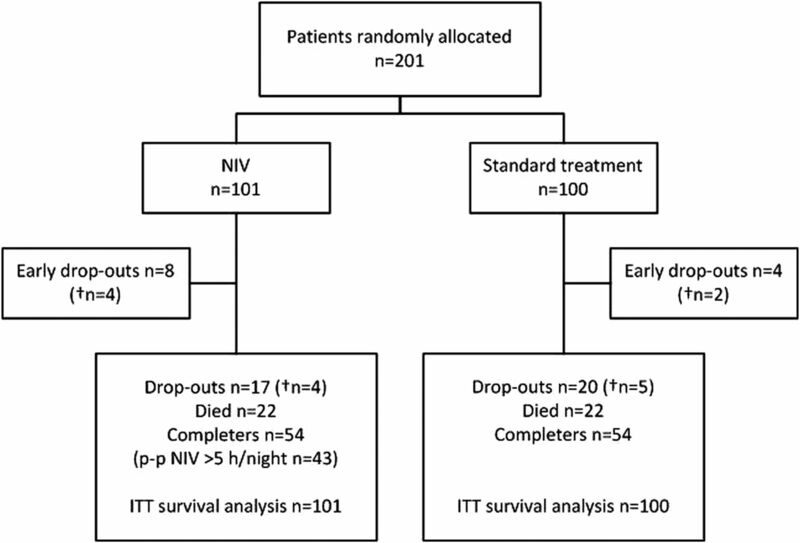 Figure 2 shows the ITT event-free survival of both groups in the first year, which was not significantly different (mean number of days to event was 192 and 198 for the NIV and standard treatment groups, respectively, p=0.85). Kaplan–Meier plot of time to event (readmission for respiratory cause or death) in patients randomised to non-invasive positive pressure ventilation (NIV) and standard treatment. After 1 year, readmission to hospital for respiratory causes occurred in 56% versus 57% in the NIV and the standard treatment groups, respectively. The median (range) number of readmissions during the 12 months of follow-up did not differ significantly between groups (1.0 (0–9) in NIV vs 1.0 (0–6) in the standard treatment group p=0.23) nor did the median number of total days spent in hospital (7.0 (0–107) in NIV vs 3.5 (0–77) for standard treatment) (p=0.087)). The number of deaths after 1 year was 30 and 29 in the NIV and standard treatment groups, respectively, with a mean number of survival days of 299 for NIV and 291 days for the standard treatment group (p=0.99) (see online supplementary table S2). 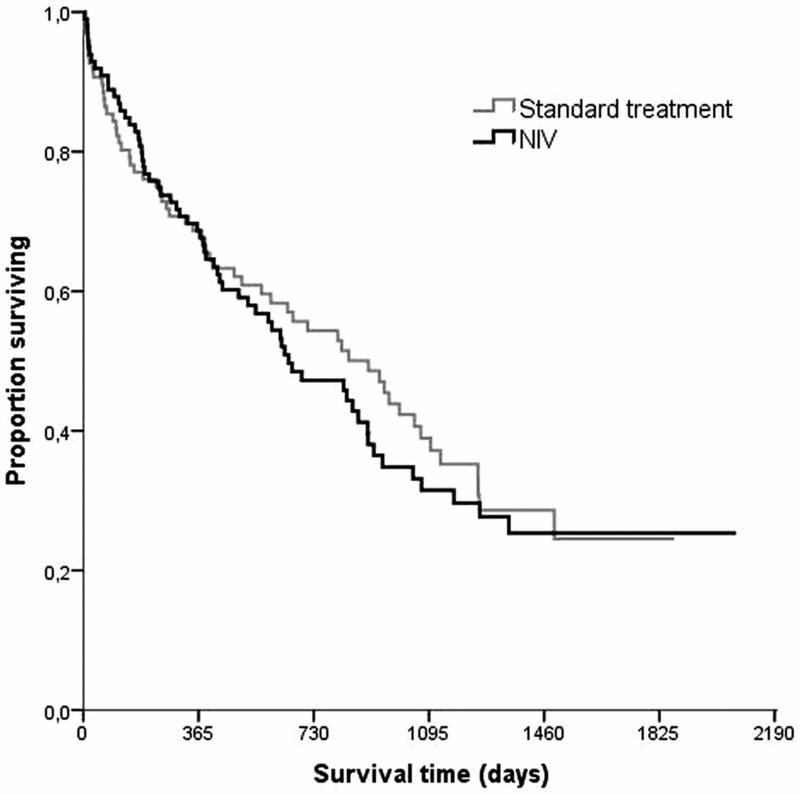 Long-term survival is shown in figure 3, with 63 deaths in the NIV group versus 58 in the standard treatment group. Kaplan–Meier plot of long-term survival curves of patients randomised to non-invasive positive pressure ventilation (NIV) and standard treatment. Because of small numbers of patients followed up after 3 years, the right-hand end of the survival plots remains uncertain. No difference was observed between the annual median (range) number of exacerbations at home: 1.0 (0–9) for the NIV and 2.0 (0–14) for the standard treatment group (p=0.26). After 12 months, daytime PaCO2 improved significantly more in the NIV group compared with standard treatment (table 2, figure 4). Daytime PaCO2 and PaO2 at baseline, 3, 6 and 12 months (means±SD). Measurements performed in complete case group (n=54 per group) regardless of oxygen use. NIV, non-invasive positive pressure ventilation; PaCO2, arterial carbon dioxide pressure (kPa); PaO2, arterial oxygen pressure (kPa). *Change in PaCO2 was significantly better in the NIV group after 12 months (p<0.05). The mean nocturnal PtcCO2 measured during the night before discharge out of hospital in the ITT group was significantly better in patients on NIV compared with standard treatment (mean difference −0.8 kPa (95% CI −1.3 to −0.4; p<0.01)). In the completers, this effect was not found at baseline but was present after 12 months; mean nocturnal PtcCO2 was significantly better in the NIV group compared with standard treatment (mean difference −0.6 kPa (95% CI −1.1 to −0.1; p=0.03)). Mean FEV1 and vital capacity did not change significantly after 12 months within the NIV group or standard treatment group nor was there a significant change between groups (table 3). HRQL, activities of daily living, anxiety/depression scores and dyspnoea improved in both groups but there was no significant difference between the groups (table 4 and see online supplementary tables S3–S7). HRQL measured by the SRI total score showed a clear trend (p=0.054) with additionally significant differences between groups on the subdomains ‘attendant symptoms and sleep’ and ‘social relationships’ in favour of the NIV group (see online supplementary file). All results were similar in the per protocol analysis comparing patients with NIV>5 h/night with standard treatment. Thus far, this is the largest randomised, controlled multicentre study reporting on the effects of NIV in COPD patients with prolonged hypercapnia after an episode of NIV for ARF. It showed that nocturnal NIV does not prolong the time to readmission for respiratory causes or death in COPD patients who remain hypercapnic after ventilatory support during ARF. Compared with standard treatment alone, NIV improves daytime PaCO2 and nocturnal transcutaneous PCO2 but does not improve survival, number of respiratory readmissions, exacerbations, lung function, HRQL, mood state, daily activity levels or dyspnoea. In this large study, the design was practical and executed as in ‘real-life’, which make outcomes more broadly applicable (patients remained in their own hospital and blood gas and lung function measurements were performed during their regular visits to their own pulmonologist), but does make it difficult to compare our outcomes with previous studies in this field and therefore necessitates further discussion and comparison. First, Funk et al14 reported positive results in an RCT including similar patients (COPD patients remaining hypercapnic after ARF requiring mechanical ventilation), showing a higher probability of clinical worsening in the control (withdrawal) group compared with the NIV group. A crucial difference in trial designs is that all patients first received NIV for 6 months after which one group was randomised to stop NIV (withdrawal group). Clinical worsening was defined as (1) an intensive care unit admission for treatment of acute-on-chronic respiratory failure requiring mechanical ventilation, but for the withdrawal group escalation additionally comprised of (2) voluntary resumption of NIV due to severe dyspnoea and (3) re-institution of NIV due to progressive hypercapnia. A pitfall of this approach was that, as the authors also note themselves, by definition the achievable endpoints depended on the group allocation of the patient as the NIV group could only qualify for the first endpoint. Results after 12 months follow-up showed that 10 patients in the withdrawal group versus two in the NIV group experienced clinical worsening (p=0.0018). But upon looking more closely and, comparing only the endpoint which was achievable for both groups, only three out of the initial 10 patients in the withdrawal group (vs two) were admitted to the ICU for acute-on-chronic respiratory failure. Other positive outcomes in favour of NIV were a significant difference in 6-min walking distance after 3 months and a slightly lower resting daytime pH in the withdrawal group after 12 months. Our data show a higher daytime pH in the NIV group, but we did not consider this improvement clinically relevant (as patients were not acidic at baseline). We could not perform the 6-min walking test since most patients were too weak to perform this test adequately and safely, raising ethical concerns. Second, in a randomised pilot trial by Cheung and colleagues6 with similar inclusion criteria as in our study, chronic home NIV was compared with placebo NIV (CPAP of 5 cm H2O). In this study, primary outcome was recurrent severe COPD exacerbation with acute hypercapnic respiratory failure (AHRF), resulting in NIV, intubation or death within the following year. The proportion of patients developing this condition in 1 year was 38.5% in the NIV versus 60.2% in the placebo group (p=0.039). Compared with our study, these patients were older (mean age 70) and had a lower mean BMI (19.2) suggesting a group of patients in worse condition than in the present study. The authors point out that ethical concerns led them to be prudent and to act upon severe enough exacerbations by instituting NIV, which could indicate a bias towards earlier conversion to NIV in the CPAP group and a possible explanation for the difference in proportions between groups. Furthermore, this trial did not find a difference in survival, arterial blood gasses and adverse events between groups. Third, our power analysis was based on the study by Chu et al5 who found that 80% of COPD patients with AHRF who were successfully treated by NIV were readmitted to hospital for respiratory problems within the following year. Our primary outcome consisted of readmission for respiratory causes but also death, probably leading to higher percentages of patients in which ‘the event’ would occur. Ideally, it would be more appropriate to power on pilot data from our own country or a similar European Healthcare system but as this was the only study at that time we had to work with these numbers. We hypothesised that in our study, the NIV group would have a 20% lower prevalence of readmission for respiratory causes than the standard treatment group (ie, 60% prevalence of readmission). However, our study shows a much lower prevalence of readmission in both the NIV and the standard treatment groups (56% and 57%, respectively). A possible explanation could be that patients recruited in the study by Chu et al5 were older (mean age 73.2) and had a lower BMI (20.2), indicating a worse physical condition. Our results do show similarities with a Spanish study26 which was published during our inclusion phase, reporting readmission rates of 66% due to respiratory complications in COPD patients who survived an acute exacerbation with ARF that required NIV. As patients were included during an admission for ARF, we anticipated blood gasses to improve in the first months after discharge from hospital in both groups. Although PaCO2 was better in the NIV group after 12 months, we did not expect to see the same level of improvement in PaCO2 in the standard treatment group in the first 3 months (figure 4). If we assume that the improvement in the control group is the natural recovery of the disease, one might conclude that the included patients might not be the right target group for chronic NIV. The patients in this trial are possibly a mixed cohort of acute-on-chronic respiratory failure and ARF, and therefore a subgroup analysis might be interesting. However, the hypothesis tested in this study is still legitimate as hypercapnia persisting postexacerbation is an increasingly common reason for initiation of NIV in patients with COPD. Another possible subgroup analyses for the future concerns the need for supplementary oxygen. This subgroup is likely to indicate a more severe disease state and this would be a group expected to have greater therapeutic benefit with chronic NIV. A limitation in our study was our inability to obtain blood gasses on patient's standard oxygen level as patients were reluctant to undergo testing twice. Although our aim was to only obtain samples on room air, a portion of patients refused to stop their oxygen, making comparison of data difficult. Nevertheless, patients on NIV were adequately ventilated during the night as their mean nocturnal PtcCO2 was significantly better compared with standard treatment. In an RCT on NIV in stable COPD, Clini et al12 did not find a difference in PaCO2 between NIV and the control group (LTOT) during room air breathing whereas they did show a significant difference when measured on patients’ usual oxygen regimen. Also, long-term oral corticosteroid treatment is suggested to negatively impact on readmission rates and outcome. Since NIV patients more frequently received oral corticosteroids (ITT 53% vs 38%) this could also have affected the results. The fact that we were able to obtain extensive data on HRQL is unique. During our study, we published an article28 in which reliability and validity of the CCQ, CRQ, MRF-28 and SRI questionnaires were assessed and compared from our patients at baseline. Although, all four questionnaires were feasible in these types of patients, the SRI scored tested most appropriate. This is reflected in our data after 12 months which show a clear trend towards improved HRQL as measured by the SRI total score. Two out of the seven subdomains were significantly improved in the NIV group compared with standard treatment. The very opposite was reported in the RCT by McEvoy et al13 who demonstrated a survival advantage of chronic NIV in hypercapnic stable COPD but accompanied by a deterioration in HRQL (measured by the more general St. Georges Respiratory Questionnaire). We believe this emphasises the need to consistently use severity-specific HRQL questionnaires like the SRI and MRF-28 to further explore the possible benefits of NIV in future research, for instance, the supportive role of NIV in advanced care planning also. We could not demonstrate an improvement in time to readmission or death by adding NIV for 1 year in COPD patients who remained hypercapnic after an episode of NIV for ARF. There is no reason to believe the NIV was not effective since daytime PaCO2 and night-time PCO2 improved. The trend for improvement in HRQL favouring NIV we believe nevertheless should be explored further. We would like to thank all patients who participated in the study. Furthermore, we especially would like to thank all HMV nurse practitioners involved in patient recruitment: M Coolen, A Kroos, LWijnands, P Heijnen, D van den Assem and all participating pulmonologists and respiratory nurses who contributed to the study. Finally, we want to thank the Dutch Lung Foundation and Stichting Astma Bestrijding.
. One year period prevalence study of respiratory acidosis in acute exacerbations of COPD: implications for the provision of non-invasive ventilation and oxygen administration. Thorax 2000;55(suppl 7): 550–4.
. Randomised controlled trial of nasal ventilation in acute ventilatory failure due to chronic obstructive airways disease. Lancet 1993;341(suppl 0140–6736; 8860):1555–7.
. Noninvasive ventilation for acute exacerbations of chronic obstructive pulmonary disease. N Engl J Med 1995;333(suppl 0028–4793; 13):817–22.
. Domiciliary non-invasive ventilation for recurrent acidotic exacerbations of COPD: an economic analysis. Thorax 2003;58(suppl 10):867–71.
. Readmission rates and life threatening events in COPD survivors treated with non-invasive ventilation for acute hypercapnic respiratory failure. Thorax 2004;59(suppl 0040–6376; 12):1020–5.
. A pilot trial of non-invasive home ventilation after acidotic respiratory failure in chronic obstructive pulmonary disease. Int J Tuberc Lung Dis 2010;14(suppl 5):642–9.
. Efficacy of nocturnal nasal ventilation in stable, severe chronic obstructive pulmonary disease during a 3-month controlled trial. Mayo Clin Proc 1996;71(suppl 0025–6196; 6):533–42.
. Nasal pressure support ventilation plus oxygen compared with oxygen therapy alone in hypercapnic COPD. Am J Respir Crit Care Med 1995;152(suppl 1073–449; 2):538–44.
. Effects of nocturnal noninvasive mechanical ventilation on heart rate variability of patients with advanced COPD. Chest 2007;131(suppl 1):156–63.
. Nocturnal positive-pressure ventilation via nasal mask in patients with severe chronic obstructive pulmonary disease. Am Rev Respir Dis 1991;144(suppl 0003–0805; 6):1234–9.
. Nocturnal non-invasive positive pressure ventilation for stable chronic obstructive pulmonary disease. Cochrane Database Syst Rev 2013;6:CD002878.
. The Italian multicentre study on noninvasive ventilation in chronic obstructive pulmonary disease patients. Eur Respir J 2002;20(suppl 0903–1936; 3):529–38.
. Nocturnal non-invasive nasal ventilation in stable hypercapnic COPD: a randomised controlled trial. Thorax 2009;64(suppl 7):561–6.
. Long-term non-invasive ventilation in COPD after acute-on-chronic respiratory failure. Respir Med 2011;105(suppl 3):427–34.
. Global strategy for the diagnosis, management, and prevention of chronic obstructive pulmonary disease: GOLD executive summary. Am J Respir Crit Care Med 2013;187(suppl 4):347–65.
. CBO guideline ‘Oxygen therapy at home’. Ned Tijdschr Geneeskd 2001;145(suppl 41):1975–80.
. Non-invasive monitoring of CO2 levels in patients using NIV for AECOPD. Thorax 2006;61(suppl 4):363–4.
. Analysis of factors that characterize health impairment in patients with chronic respiratory failure. Quality of Life in Chronic Respiratory Failure Group. Eur Respir J 1999;13(suppl 0903–1936; 6):1293–300.
. Measurement of health-related quality of life in chronic airflow limitation. Monaldi Arch Chest Dis. 1993;48(suppl 5):554–7.
. The Severe Respiratory Insufficiency (SRI) Questionnaire: a specific measure of health-related quality of life in patients receiving home mechanical ventilation. J Clin Epidemiol 2003;56(suppl 8):752–9.
. The hospital anxiety and depression scale. Acta Psychiatr Scand 1983;67(suppl 6):361–70.
. The assessment of disability with the Groningen Activity Restriction Scale. Conceptual framework and psychometric properties. Soc Sci Med 1996;43(suppl 11):1601–10.
. Usefulness of the Medical Research Council (MRC) dyspnoea scale as a measure of disability in patients with chronic obstructive pulmonary disease. Thorax 1999;54(suppl 0040–6376; 7):581–6.
. Nocturnal noninvasive positive pressure ventilation in stable COPD: A systematic review and individual patient data meta-analysis. Respir Med 2014;108:329–37.
. Prognosis following acute exacerbation of COPD treated with non-invasive mechanical ventilation. Arch Bronconeumol 2010;46(suppl 8):405–10.
. Outcomes following non-invasive ventilation for hypercapnic exacerbations of chronic obstructive pulmonary disease. Thorax 2011;66(suppl 9):825–6.
. The Severe Respiratory Insufficiency Questionnaire scored best in the assessment of health-related quality of life in chronic obstructive pulmonary disease. J Clin Epidemiol. 2013;66(suppl 10):1166–74. Contributors FS was the coordinator of the study, directly involved in the project design, patient recruitment, data collection and analysis, and is the main author of the manuscript. GB contributed to data collection and reviewed the final version. The following authors were the main investigators in the collaborating centres and directly involved in patient recruitment and data collection and reviewed and approved the final version of the manuscript: RS, MZ, JA and NC. HK was involved in the design and execution of the study. JV and HK supervised the data interpretation and reviewed and approved the final version of the study. PW was the main investigator, led the study group, contributed to the design of the project, and contributed to and approved the final study; he is the guarantor of the entire study. Funding This study was funded by the Dutch Lung Foundation, Philips/Respironics, Mediq TEFA and Stichting Astma Bestrijding (AF 3.4.06.044 and 2010/10). Funding sources had no involvement in the study design; in the collection, analysis and interpretation data; in the writing of the report; and in the decision to submit the paper for publication. Competing interests FS, HK and GB report grants from Philips/Respironics, grants from Dutch Lung Foundation, grants and non-financial support from Mediq TEFA, and grants from Stichting Astma Bestrijding during the conduct of the study. PW reports grants from Philips/Respironics, grants from Dutch Lung Foundation, grants and non-financial support from Mediq TEFA, and grants from Stichting Astma Bestrijding during the conduct of the study. He reports fees from Philips/Respironics, RESMED and VIVISOL. Outside the study, he reports grants from RESMED, VIVISOL, Goedgebeure and Air Liquide. Ethics approval Medical Ethical Committee from the University Medical Center Groningen. Trials of home mechanical ventilation in COPD: what have we learnt? Domiciliary long-term non-invasive ventilation in COPD: should we select subgroups with a better likelihood to respond to NIV in subsequent randomised controlled trials? Response to: Domiciliary long term non-invasive ventilation in COPD: should we select subgroups with a better likelihood to respond to NIV in subsequent randomised controlled trials?